The future of work, pretty obviously, will include more and more of us moving out of our cubes and into coffee shops and coworking spaces. With the technology to get your job done from nearly anywhere, why tie yourself to a soul-crushing, gas-guzzling commute and a rigid nine-to-five schedule? Plus, plenty of experts tell us, more and more folks are becoming independent contractors who won’t even have a corporate base to flee from. But are there any other areas of life that will become less like we know them now and more like the current cafe experience? 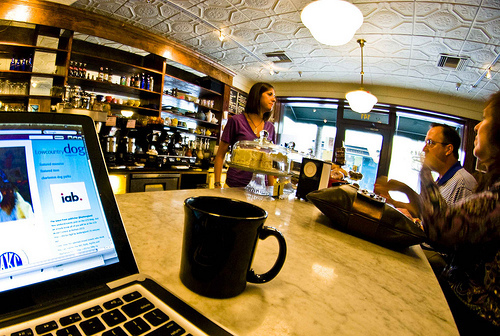 We’re going back to the future: the modern office was birthed in 17th century coffee shops. Steven Johnson has argued that coffee fueled the enlightenment. It was certainly a more enlightening beverage than the previous choice of alcohol. Now a single person with $500 can duplicate most of those functions with a single laptop computer. So the remaining function of the office is to be that place that clients know to find you. . . . Groups for one project will form and then disband and then reform with new members for the next project. What will that workplace look like? Probably closer to Starbucks than Bob Par’s cubicle. Cheaper ultimately wins. Repeat that story a million times over the next few years and you begin to see how the local colleges – which already are overcharging for their product – begin to suffer in favor of free programs like MITx. Eventually you could have local campuses becoming places where MITx students seek tutoring, network, and socialize – reclaiming some of the college experience they’d otherwise have lost. [Fellow Speculist blogger Phil Bowermaster] thought this sounded like college as a giant coffee shop. I agree. Every education would be ad hoc. It would be student-directed toward the job market she’s aiming for. For the sane: Starbucks. So if you can accomplish your Walmart shopping at Starbucks, why do it any other way? Also, imagine the 3D print shop of the future. You put in your order, probably from your smart phone, and then go pick it up. What does the lobby of such a business look like? Again: a coffee shop. Should we all prepare to drink a lot more coffee in the future (or invest in coffee producers)? This obviously works for self-employed folks. Those who hire employees, however, will probably only use remote workplaces when the work can be measured and can be accomplished alone. Part of the function of a workplace is to move employees in the same direction and encourage colaboration. Employers know that the principal reason folks want to work at home or at Starbucks is that the hours dedicated to work are fewer. When I take a break to change the laundry from the washer to the dryer, the company gets no benefit. On the other hand, employees do a lot of extraneous conversing at work, so some of it is a tradeoff. Thanks! Good article. I concur … from my perspective, the coffee shops is the future of everything. As a freelancer, I spend a large amount of time working in independent coffee shops. In Birmingham UK, the indie coffee scene is home to a vibrant community of small business owners, freelancers, creatives and people from all sectors having business meetings. It is the place to do business, to work, to hang out and to drink quality coffee. We also run a monthly #jelly (hosted by @rickiewrites) from a coffee shop (@urbancoffeeco). Check out this blog piece on the upcoming jelly in Birmingham which demonstrates the importance of coffee shops for doing business: ow.ly/9sq7v. Great article and very good comments by all here. I think part of Shelley’s comment hit the nail on the head by saying this “workstyle” is not for everyone. Of course it isn’t for everyone, and I’m really happy she said that. What it really means is that despite its rise in popularity, the coffee shop is not the only alternative to the “traditional model workplace” as described by Arkadiusz. But it’s there if you want or need it…mainly thanks to technology. With telecommuting (teleworking, workshifting, mobile working, etc.) on the rise pretty much everywhere, location is simply becoming less of an issue. You can choose a coworking facility in your area, a park bench nearby or just walk to work in your pyjamas and slippers. I’m just elated by the choices made possible by a technology, which, as noted above by futurist Stephen T. Gordon, is a small ($500) investment away. As for the Starbucks/Walmart reference — I was reminded of a recent trip to a Target where I spotted the green lady logo and a smiling barista…inside the store! Starbuck is outdated look at http://www.seats2meet.com for a real life example or visit it when your in Utrecht, The Netherlands. This is the way a lot of my business was done in Wellington, NZ. Not at the exclusion of using offices as well, but a lot of business deals are done over coffee in one of the ubiquitous (and outstanding) cafes there. Have to confess… i do miss that…. The trend of virtual workteams and contract work certainly seems to be on the rise, though I’m not sure the cafe setting works for everyone. Many of these positions require frequent phone and web conferencing that just won’t work well in a public setting. Though I suppose that doesn’t mean that folks can’t escape to a coffee shop for snippets in between conferences. That’s tasty vision of the future. However to make it happen we will have to face at least 2 challenges: 1. Traditional mental model of workplace which dominates in the society “The office is how serious work/company looks like” 2. The need to have a feeling of control/impact which comes from physical proximity. It provides the the impression of security for both managers/business owners as well as many employees. I still need the office to hammer out strategies with colleagues. We use collaborative software Dooster and so only need to meet up once a week. The coffee shop’s still good for a getaway though when you want a change of scene at home. But why run an office for one day a week? Why not just hire a meeting space? So the pressure’s on (pun intended) to invent the quieter espresso machine. This sounds and looks good, it’s just that I believe this scenario will only be possible for a small minority. Either that or working there as a barista.